Back in April, the Nook Color underwent a magical change of sorts: a software update that transformed the device from a color screen e-reader into an honest to goodness Android tablet. It was the company's first swipe at the space -- a backdoor approach that beat out fellow e-reader manufacturers like Amazon and Kobo. 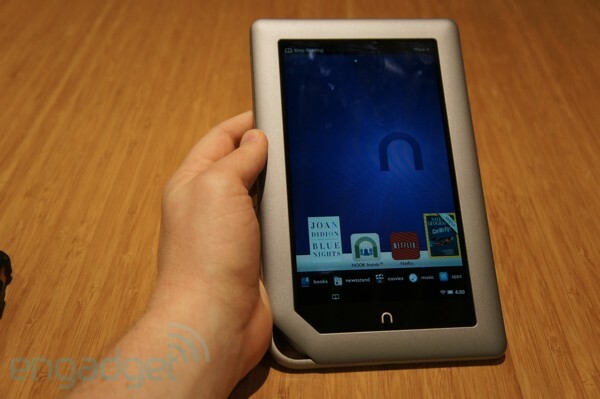 Its follow-up, the Nook Tablet, marks the company's first out-of-the-box shot at the consumer tablet market. Not to mention, it also goes head to head with the Kindle Fire, a device that's sure to be one of the best-selling gadgets of the holiday season, thanks to its price and wide content selection. 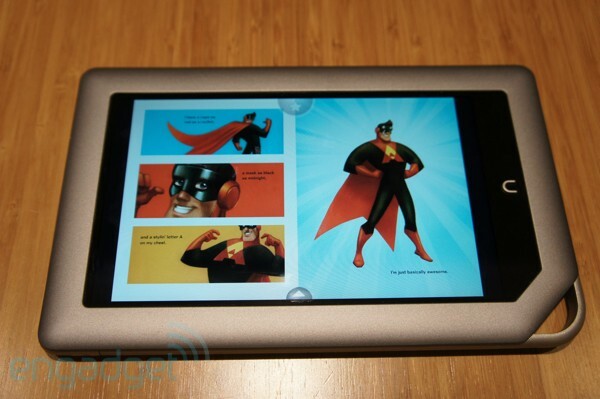 Does the Nook Tablet have what it takes to topple the Kindle Fire? Do the product's benefits justify its $50 premium over Amazon's device -- or the recently discounted and soon to be upgraded Nook Color for that matter? Find out the answers to these questions and so, so many more, after the break. Barnes & Noble's budget tablet manages to give the Kindle Fire a run for its money, even though it costs $50 more. How would you rate the nook Tablet? Kindle Fire vs. Nook Tablet...fight! Need a fun way to pass the time this weekend? 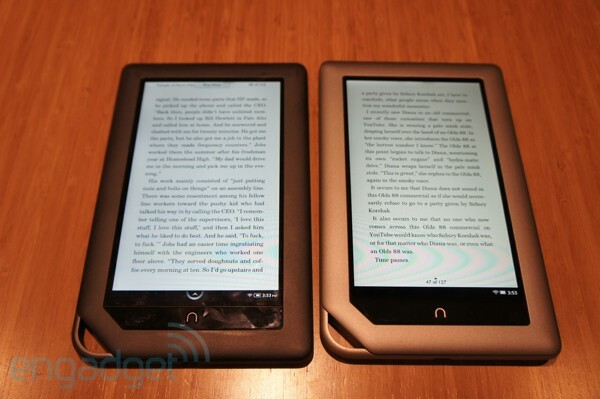 Why not roll down to your local Barnes & Noble for a round of "Nook Tablet or Nook Color?" It's the gadgety game that's sweeping the nation. Yes, it's been said before, but it bears repeating: the Tablet is nearly identical to its predecessor. When we asked Barnes & Noble why it opted to go with the same form factor, a company rep told us it was because the Nook Color was such a successful device with an immediately recognizable design. In other words, the Nook Color wasn't broken, so B&N didn't fix it -- besides, the company surely wanted to make the most of its Yves Behar investment. The only major changes to the body are a lighter color (a metallic silver to the Color's dark gray) and a slightly more textured back, which should help when it comes to keeping the thing from slipping to the floor during a particularly saucy D.H. Lawrence passage. Also, in spite of some revamped innards, the company managed to shed a little more than an ounce on the reader, knocking it down to 14.1 ounces (400 grams) -- half an ounce less than the Fire. 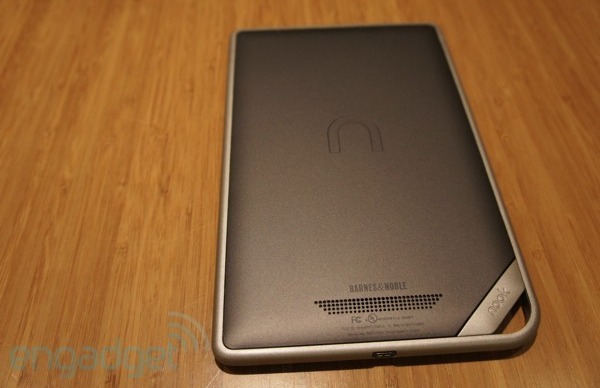 However, familiar it is, the Nook Tablet has a distinctive design in a market filled with iPad lookalikes. And yes, its chief competition, the Kindle Fire, looks an awful lot like the BlackBerry PlayBook, as we've mentioned many times before. The most distinctive feature, hands-down is the little carabiner loop that juts out from the bottom left corner of the reader, a design decision largely to set the device apart from other tablets according to B&N -- and to offer some protection for the slot that lies on the other side. Two large volume buttons are located on the top of the Tablet's left side, with the power button on the right side. The Nook has four physical buttons in all -- three more than the Fire's solitary power button, a plus for easy access and those moments when the touchscreen acts up, which has certainly been known to happen on these budget tablets. Oh, and unlike the Fire, you can actually adjust the volume without diving into the settings. Point Barnes & Noble. A headphone jack is located along the top of the slate, with a micro-USB port positioned at the center of the bottom. Flip the device over, and you'll see a small speaker grill. The speaker has been bumped up a bit this time out. It can achieve a audible volume, but like the Kindle Fire, the quality is abysmal. You'll most likely find yourself reaching for the headphones (not included). The back of the Tablet is convex (which is why it comes in a tiny bit thicker than the Fire), so it conforms to the hand a bit better than the perfectly flat Kindle Fire. A big, indented lowercase "n" sits in the middle of the non-removable back. On the bottom, next to the carabiner is a silver strip reading "nook." 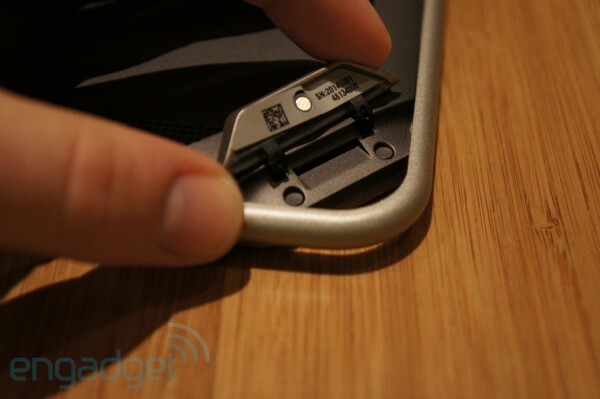 Pry it open with a fingernail and you'll find the microSD slot. The Nook has a nice size and shape that come in handy during long reading sessions -- something B&N clearly took into account when building it. Your thumb grips comfortably around the plastic bezel, with your fingers on the upside down horseshoe on the rear, which brings to mind the Nook Simple Touch's concave backing.This might have served as another avenue for aesthetic distinction here, though no doubt would have ultimately served to add more girth to what is already a largish footprint for a seven-inch tablet. 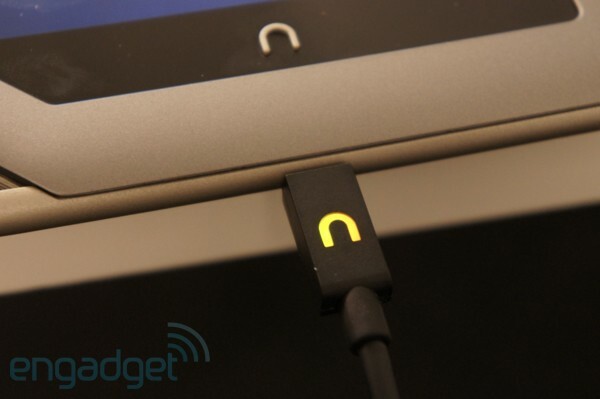 The Nook ships with a micro-USB cable and AC adapter, which you'll need to charge it up -- no PC charging for this guy. The former has the device's "n" logo on one end, changing color with battery status: yellow for charging and green for full. Sure, you can simply unlock the device to find out, but it's a nice little extra touch. Here's where the Tablet shines, compared to its older brother. Here, B&N has given us a 1GHz dual-core processor and 1GB of RAM, both upgrades from the Color's 800MHz single-core CPU and 512 MB of RAM. The RAM is also double that of the Fire, though the processor clocks in at the same speed. As with the Fire, the Nook Tablet only comes in one flavor, spec-wise -- B&N likely didn't think it would be able to get away with offering another level for $50 more. 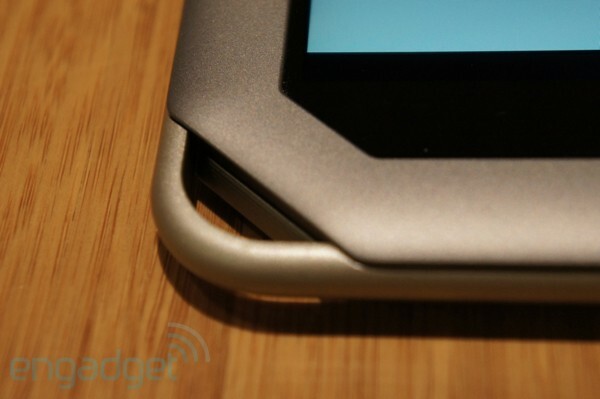 After all, it already chose to keep the Nook Color around for $199. 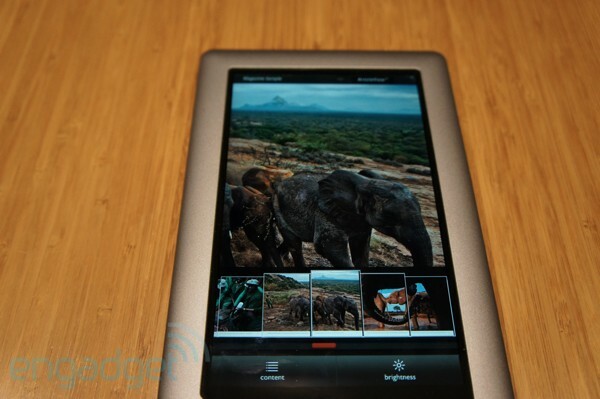 The Nook Tablet steps things up on the storage front, too, with 16GB -- double that of the Kindle Fire. Things get a little tricky here, however. As with the Fire, around 2 to 3GB are monopolized by OS-related content. A full 12GB of the Nook's storage, meanwhile, are devoted to content downloaded from B&N, like books and magazines. That leaves a paltry 1GB of storage for non-B&N content -- i.e. all of the stuff you're side-loading onto the device. That may not sound like a crazy proposition if you're only planning to store some documents on the thing, but if you were planning on storing a bunch of music and movies from your own collection, you're kind of out of luck. And, indeed, the ability to simply drag and drop content from a PC and have it show on the device is certainly a selling point for the Nook Tablet. Barnes & Noble assures us that, as the company moves forward with multimedia deals in the year ahead, more third-party content will be storable in that 12GB section. There are a few things to note here on top of that promise. First, like Amazon, B&N is really focused on streaming multimedia content here through apps like Netflix, Hulu Plus and Pandora, all of which come preloaded on the Tablet. Also, there's the aforementioned expandable memory, a feature that Amazon has roundly eschewed in its Kindle line. Pick up a microSD card, and you can rock up to an additional 32GB of storage. Connectivity-wise, we're talking WiFi. As with the Fire, there's no 3G option here, and if the Color is any indication, don't expect to see one any time soon. The Nook maintained a WiFi connection fairly well, even managing in some places where the Fire failed. The company is also taking advantage of its brick and mortar presence to offer up free in-store WiFi on the Tablet, as with its other Nook brethren. As far as Bluetooth goes, however, you're gonna have to look elsewhere. Pick up an SD card, and you can rock up to an additional 32GB of storage. As with the rest of the outside of the Tablet, Barnes & Noble left the Nook Color's screen intact. Like the Fire, we've got a 1024 x 600 seven-inch IPS LCD. 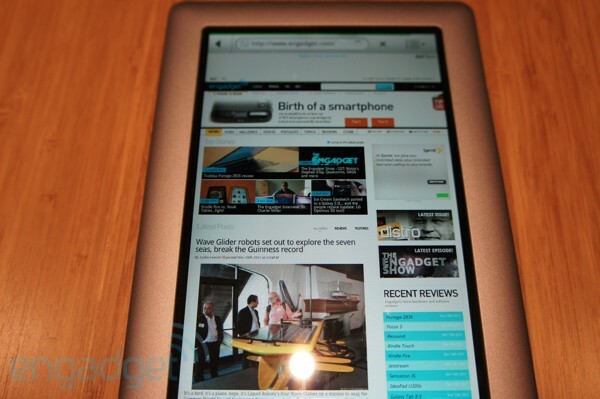 Placed against Amazon's device, the Nook Tablet seems a touch brighter. B&N is talking up the diplay's lamination, which helps reduce glare, helping improve the Tablet's viewing angles. The glare does appear to have been reduced just a bit, but again, we were hard pressed to detect any major differences between the Nook and the Kindle in that department. Again, the perpetual e-reader vs. tablet disclaimer is in place here: if you're just in the market for a device to read long chunks of prose on, invest in a Nook Simple Touch or Kindle Touch. E-ink is easier on the eyes than backlighting for long stretches and is much more easily read in sunlight. That said, you can read the Nook Tablet in a dark room, without the aid of a booklight, and there's surely something to be said for that, right? As with the Fire, the Nook Tablet's battery pales in comparison to its E Ink brethren, but as far as seven inch color tablets go, the device didn't do all that shabby in our standard battery rundown test, managing eight hours and twenty minutes on a charge. It's not quite the "up to nine hours" promised by the company, but it still handily beat the Kindle Fire's seven hours and 42 minutes. That'll get you through a lot of Archer episodes on Netflix. As mentioned earlier, the internals are the key distinction between the Nook Tablet and its still very much alive predecessor. This time out, the Nook is rocking a 1GHz dual-core processor and 1GB of RAM, and yes, there's a noticeable difference in speed, even with something as simple as loading an app like Angry Birds. The distinction is a bit less pronounced between the Kindle Fire and the Nook, though it is there, with the Nook just beating the Fire when loading apps. The Tablet was able to take just about everything we threw at it with minimal hiccups. The most clear performance distinction between the Fire and the Tablet can be seen when playing video. There isn't a ton of distinction between the Nook and the Fire, when it comes to browsing. The Kindle seems a bit more equipped to handle text and the Nook does a better job with images when loading pages. Both devices do pinch-to-zoom, scrolling and the like capably. SunSpider 9.1 told a bit of a different story, with the Nook racking up a 4,135 -- that's low, especially compared to the Fire's score of 2,440. The difference in results may have something to do with the Kindle's Silk Browser, which utilizes Kindle's massive server resources, to do the heavy lifting for page rendering -- a tool that the company promises will continue to improve over time. The most clear performance distinction between the Fire and the Tablet can be seen when playing video. We streamed Shutter Island on Netflix and were blown away by the difference. 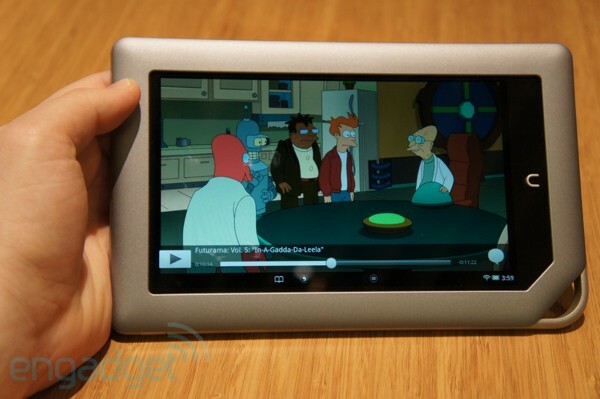 The Nook's video playback handles motion far more gracefully than the choppy Fire. And it picks up on subtle details that bleed and blur when played back on the Kindle. 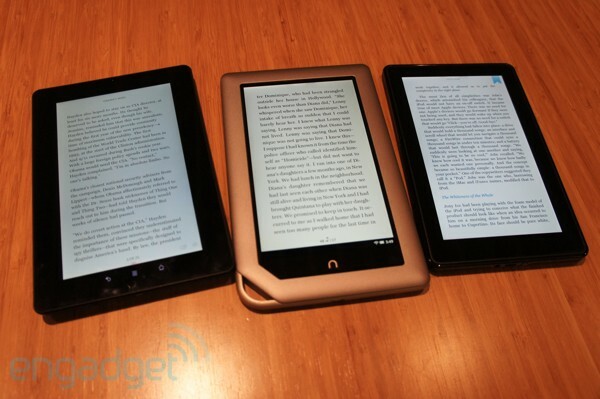 The Nook Tablet definitely wins that round. Amazon seemingly went out of its way to mask all traces of the Android interface it was running on top of. Barnes & Noble made some big adjustments to the operating system as well, but anyone who's used Android for any length or time will likely recognize the operating system. Where the Fire is locked into a bookshelf-like UI, the Nook offers up a pretty standard mobile desktop -- one with a default wallpaper that is thankfully less busy than the one offered up on the Color. The Color's top bar is largely intact here, however, deferring to the Tablet's reader roots by offering up the name of the book you've been reading. Barnes & Noble is having it both ways, however, pushing the device's multimedia functionality at the same time. Click "More," and you get a list of your books, periodicals and Netflix picks, if you're online and logged into the service. A row of icons offers up apps you've used and books you've recently read -- these can be dragged and dropped onto the desktop, if you're so inclined. Below that row are icons for including movies (via Netflix and Hulu Plus), music (via the built-in music player and Pandora), and a list of apps. Barnes & Noble is really driving home the fact that it's got a true multimedia device, this time around. Still below that row is a battery-level indicator, the time, and an open-book icon, which is visible across many of the Tablet's features, a gentle reminder that, even in the face of streaming movies and music, this device is a reader at heart. Clicking the "n" button brings up yet another menu, offering up ways of accessing home, library, the shop, search, apps, the web, and settings. Clicking the library icon will bring up an interface more like the Fire's default screen, complete with shelves. It doesn't look as good as the Kindle's classy wood design, bit does the trick. There are shelves for apps, books, magazines, newspapers, kids books and further customizable options. As with the Fire, the app selection is limited to those Barnes & Noble wants on the device. Of course, there are workarounds -- lots of them, in fact. We were feeling a bit saucy and managed to load the Amazon Appstore on the slate (here's where that microSD card comes in handy) with little effort. Or, you can always just root the Tablet. Barnes & Noble would prefer you score your content through officially sanctioned channels, of course, but the company hasn't exactly made it difficult to find other avenues. Where the Silk browser was one of Amazon's major selling points for the Fire, browsing speeds are less of a focus on the Nook Tablet. After all, Barnes & Noble doesn't have its servers doing all of the work for the device. The Nook browser doesn't offer a lot of bells and whistles, though unlike some seven-inch Gingerbread tablets like the Kobo Vox, the thing actually renders pages in their desktop form, rather than as mobile sites. Layout-wise there's not a whole heck of a lot of differences between the browsers on the Nook Tablet and Color. At top is an address bar, a back button, a star icon for bookmarks and an icon for additional options like opening up new windows, viewing bookmarks, refreshing, and paging forward. Hold down on a page, and you'll get options for searching on it, getting page info, adjusting settings, viewing your downloads and bookmarking. Zooming and scrolling are zippy on the reader. You accomplish the former by either pinching, double-tapping or clicking plus and minus buttons that pop up as you scroll. And, yes, unlike some other tablets, this one is fully capable of playing Flash video, and it does so quite smoothly. The thought of reading an image-heavy magazine on, say, the Nook Simple Touch, seems like a downright nightmare -- the grayscale images, the clunky zooming, the endless scrolling. Compared to its e-reader predecessors, the Nook Tablet's full-color multitouch screen is a delight. Given the real estate limitations of the seven-inch screen, however, there's a still good deal of pinching to zooming and scrolling happening here to properly take in all of the text and images. As we suggested in the Fire review, a 10-inch display is a far more ideal size for reading standard format magazines. Many magazines not formatted specifically for the device will show a black bar on the bottom to format them to the page -- of course, this will go away as you zoom in. As with other texts, the Nook Tablet will offer you the option of picking up where you've left off, if you've been reading a copy of a given magazine on another device. The pages have animation similar to that on the iPad, simulating the experience of flipping through a physical magazine. Tapping a page in the center will bring up buttons for the table of contents, brightness adjustment and a handy gallery of thumbnail pages that you can quickly swipe through to find a spot in the periodical that you'd like to check out. Along the top of the page is a black bar offering up the magazine's name in one corner and a plus in the other that you can tap to bookmark a page, dog ear-style. Comixology on the iPad is still the gold standard for digital comics reading. 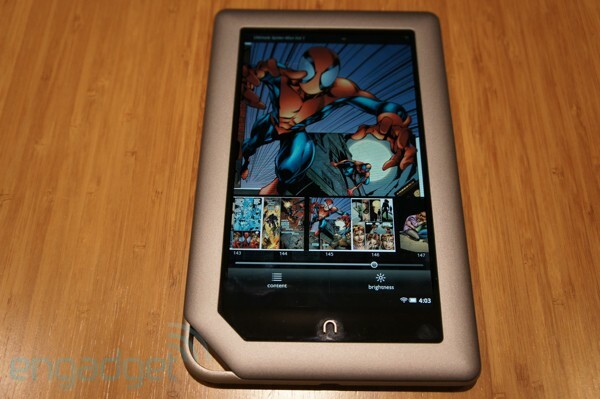 That said, the Nook Tablet's built-in comics reader certainly does an admirable job recreating the experience. The screen offers up vibrant screens for brightly color books. The blues and reds of Spider-man's costume really pop on the seven-inch screen. Unlike the Fire, the Nook Tablet can pinch to zoom in those spots of artwork that require closer inspection or pieces of text that are just too small to read with the page at full-size. However, the Fire's panel-by-panel reading method is really the ideal way to experience a comic on a screen with limited screen space. With the Nook, you regularly find yourself pinching to get a closer look and scrolling around like mad to make it around the page. Once you flip the page, the whole thing pops back into place. If you're reading a book with two-page splashes, you can shift the device to landscape mode, to look at two at once. Of course, given the size constraints, the text becomes much harder to read. The preview gallery found in magazine mode is also present here, and it looks really great flipping through brightly-colored action pages. The full-color screen is also great for kids books, and thanks to their relatively limited text, they generally scale better than magazines or comics. Given the Nook Tablet's smaller size and cheaper price point, it actually may be a better option for young readers. When you click open a compatible title, you're greeted with three options. Read By Myself gives you the standard reading experience, Read and Play offers narration that reads for you as you flip through, and thanks to a built-in mic, Read and Record lets parents record narration on a selection of kids titles, so children have someone to read to them when they're not around. A little arrow icon on the bottom of a page offers up a similar thumbnail gallery with large images of the book's pages. Some of the titles, like the Michael Chabon-penned The Astonishing Secret of Awesome Man offer up activities on each page. Clicking the star icon on the top lets kids know how they interact with the book, such as touching characters to see animations. This wouldn't be a Nook without the reading, right? In spite of all of its flashy multimedia capabilities present, Barnes & Noble clearly considers the Nook Tablet a reading device at heart. 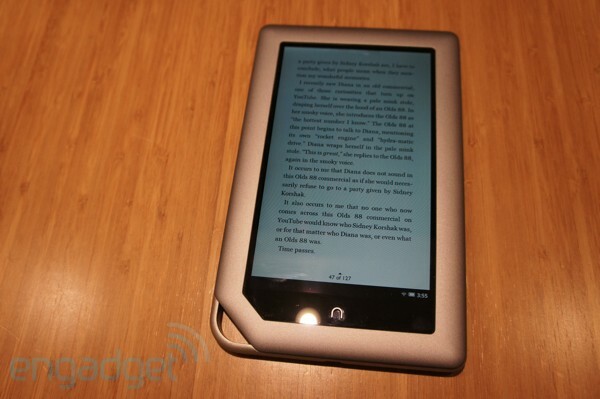 The reading experience doesn't stray too far from the one offered up by the Nook Color. The pages are monopolized almost entirely by text, save for the ubiquitous bar at the bottom offering up WiFi strength, battery level and page numbers, with both your present page and the total number in the book, a feature curiously absent from the Kindle's default layout. Clicking on the numbers brings up a slider for adjusting your place in the book. You can also just enter a number manually by clicking Go to Page. As with the Fire, you can navigate through the text by swiping forward or back or tapping a margin. Tapping on the center, meanwhile, brings up a menu offering up the table of contents, a search function, sharing, text, brightness adjustments and a Discover feature, which offers up texts similar to the one you're reading. Interestingly, both Barnes & Noble and Amazon opted not to feature a pinch-to-zoom option in the standard reading interface, choosing to use a simple method for adjusting text size instead. In the menu, you've got a healthy number of options for looking at the page, however, including eight text sizes, six fonts, six color themes from black on yellow to white on brown (for when the white LCD gets to be too much), three margins and three line spacing layouts. Barnes & Noble does a solid job leveraging the color screen here by giving you a ton of viewing options for the reasonably simple task of looking at plain text on a page. The market was already crowded well before Barnes & Noble announced the Nook Tablet, a situation that certainly didn't improve for the company with the announcement of the Kindle Fire. Anyone eyeing the Nook Tablet either as a gift or for themselves will almost certainly be cross checking it with Amazon's new much discussed slate. And then there's the fact that the Nook's predecessor didn't actually go away with the announcement of the new device -- rather, it got cheaper and better. At $249, the Nook Tablet also costs a full $50 more than those products, a difference that's not negligible when we're talking about budget devices. The words "under $200" mean a lot to shoppers. Of course, you get some decided advantages along with that premium, including more RAM, great video, a microSD slot and attention paid to smaller things, like the built-in mic, which lets users do things like recording narration for kids books. Amazon, on the other hand, offers up a smaller form factor, price and better proprietary media options. There's really no clear winner here, but with the addition of two now solid products to the ever-expanding world of tablets, there's an even greater chance that the consumer will get precisely what they're looking for.